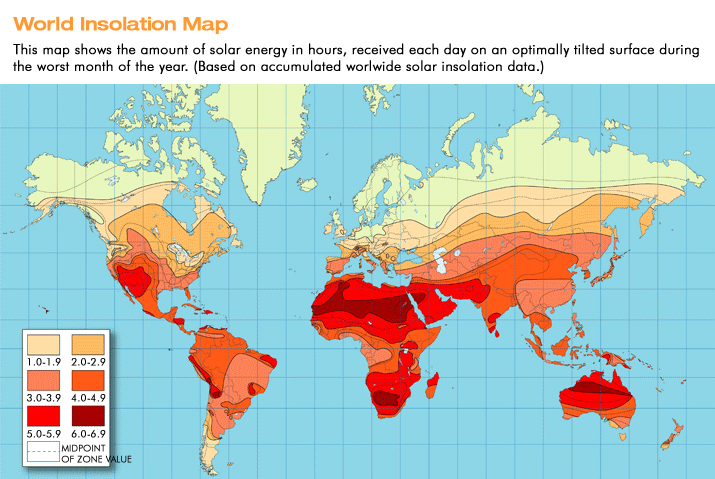 Most life and all human civilizations until the last century have lived within a solar budget. We have vastly greater understanding of science, materials, engineering and technology than at any other time in human history. We can change the lifeblood of our economy from oil to ingenuity. Thomas Edison underscored that sunshine was as practical as electricity. We only have to engineer our tools to make it so. 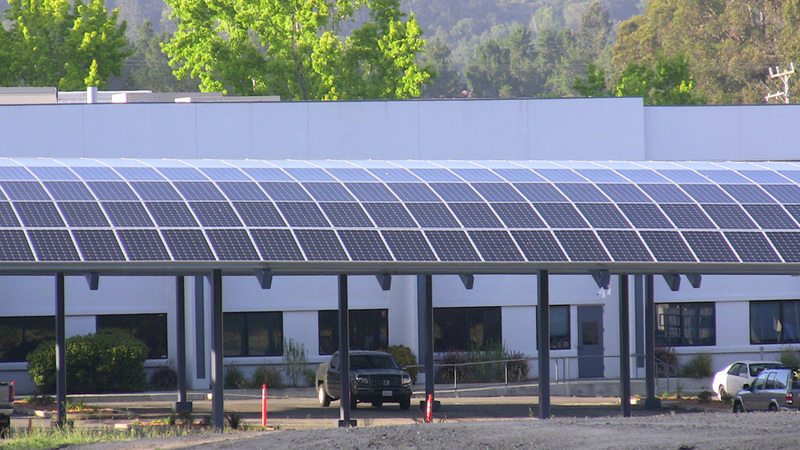 A key aspect of solar is to use it where it is generated. JPods, solar powered mobility networks, integrate the distributed nature of transportation networks with the distributed power delivered locally be the sun. "Some day some fellow will invent a way of concentrating and storing up sunshine to use instead of this old, absurd Prometheus scheme of fire. I'll do the trick myself if some one else doesn't get at it. Why, that is all there is about my work in electricity--you know, I never claimed to have invented electricity--that is a campaign lie--nail it!" "Sunshine is spread out thin and so is electricity. Perhaps they are the same, but we will take that up later. Now the trick was, you see, to concentrate the juice and liberate it as you needed it. The old-fashioned way inaugurated by Jove, of letting it off in a clap of thunder, is dangerous, disconcerting and wasteful. It doesn't fetch up anywhere. My task was to subdivide the current and use it in a great number of little lights, and to do this I had to store it. And we haven't really found out how to store it yet and let it off real easy-like and cheap. Why, we have just begun to commence to get ready to find out about electricity. This scheme of combustion to get power makes me sick to think of--it is so wasteful. It is just the old, foolish Prometheus idea, and the father of Prometheus was a baboon." "When we learn how to store electricity, we will cease being apes ourselves; until then we are tailless orangutans. You see, we should utilize natural forces and thus get all of our power. Sunshine is a form of energy, and the winds and the tides are manifestations of energy." "Do we use them? Oh, no! We burn up wood and coal, as renters burn up the front fence for fuel. We live like squatters, not as if we owned the property. "There must surely come a time when heat and power will be stored in unlimited quantities in every community, all gathered by natural forces. Electricity ought to be as cheap as oxygen, for it can not be destroyed. "Now, I am not sure but that my new storage-battery is the thing. 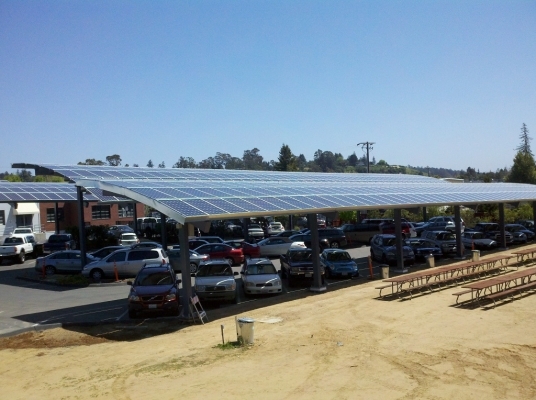 I'd tell you about that, but I don't want to bore you..."
Implementation of the Solar Collection System created by Swenson Solar, Santa Cruz, CA. Over the JPods rails, collectors will typically be 4 to 10 meters, this unit is 6.7 meters. 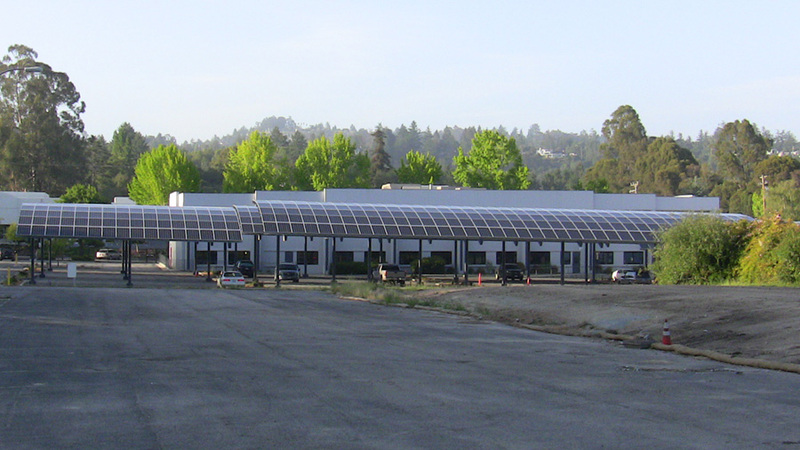 JPods solar collectors will typically be 4 to 10 meters wide, this unit is 10 meters. The units are curved. There is a small sacrifice of efficiency for this curved shape but this is more the compensated for by the improved aestetics. Aestestics are critically important. This is an installation of 3 arrays, 10 meters wide, and 80 meters long. in the field for several years. Yearly kw-hr collections on this 240 meter long, 10 meter wide array averages 367,410 for the last five full years. This equates to 4.19 megawatt-hours per day per kilometer. The weather conditions in Santa Cruz include a heavy marine fog layer for several hours each morning in the summer. This results in a solar input of about 4 Peak Sun-Hours per day . JPods vehicles require about 38.5 watt-hours to travel a kilometer. Here is a link to the Physics of JPods with associated calculations. This budget is increased to 79 watt-hours per kilometer to account for heating and airconditioning. By dividing the 4 megawatt-hours collected each day by the 79 watt-hours required to move, heat and cool a JPods vehicle per km, results in about 50,000 vehicle-km of power per km per day. Collection system by Frank Pao for over JPods stations. These systems are not designed to be as efficient as possible but to create "light play" in station areas. Net Energy is a measure of economically useful energy obtained per unit of energy required to provide that energy to the economy. Oil used to have a Net Energy of 100:1, but has depleted to 3:1 for oil sands and oil shale. 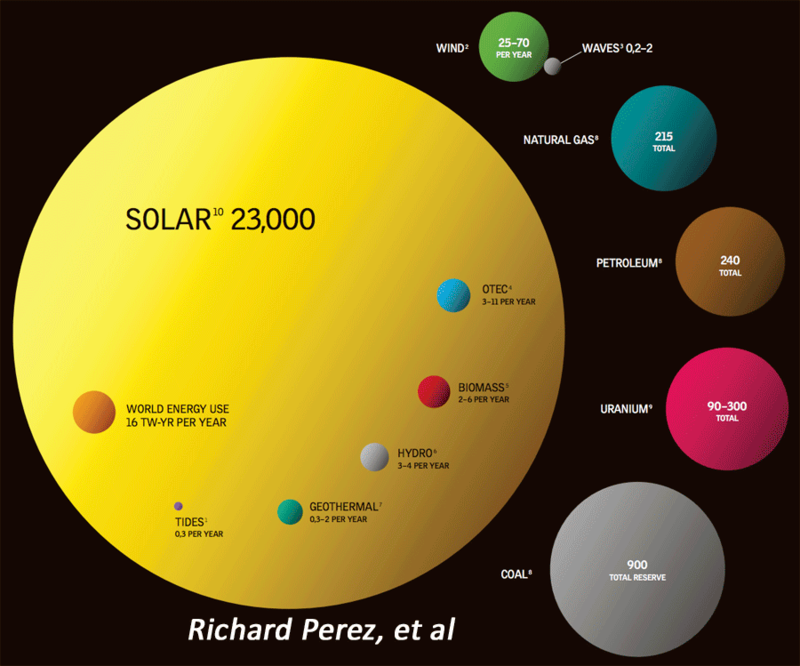 Solar and wind have Net Energies over 20:1, or 6x, six times, the Net Energy of depleting oil resources. Chris Martenson's Energy Economics provides a good summary of Net Energy. Presentation on the 17x capability of solar collection for JPods versus solar-race cars. Methane is the battery Edison was looking for. Personal Energy Servers combine into the Distributed Grid. Go to DistributedGrid.com. JPods deploys about 1 megawatt of solar collection per mile of rail. About 500,000 miles of JPods and other solar-powered mobility networks will be built in the US as soon as liberty to innovate is restored.